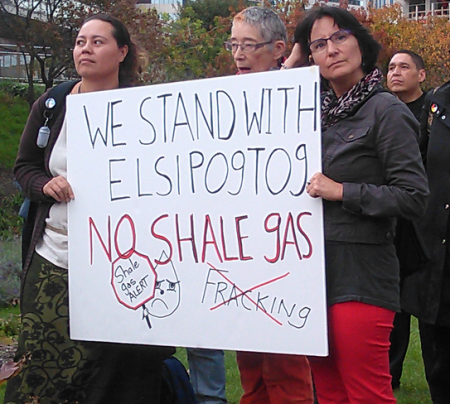 On Friday afternoon over 120 people rallied in Toronto to show their solidarity with the Elsipogtog, a New Brunswick First Nation that has recently been targeted by the RCMP due to their opposition to a plan for shale gas fracking on their traditional territory. For several months members of the Mi'kmaq community have been protesting Texas based SWN Resources and their attempts to carry out work that is needed before gas fracking can take place. Yesterday the mounties forcefully moved in on the protestors and arrested at least 40 people. The solidarity rally in Toronto was held outside a National Energy Board hearing in to a separate proposed energy project that would reverse the flow of an existing Enbridge pipeline. The proposed Line 9 reversal would allow oil to be brought east to Montreal. "We are here to stand in solidarity with Elsipogtog and all the other First Nations that are leading the way" said Jamaias DaCosta, one of the speakers at the rally," This is not just an indigenous issue, but indigenous people are leading the way. " "If shale gas is allowed to continue we will have toxic water coming out of our taps" Da Costa told the crowd, "Water is life, if we don't have water we die." 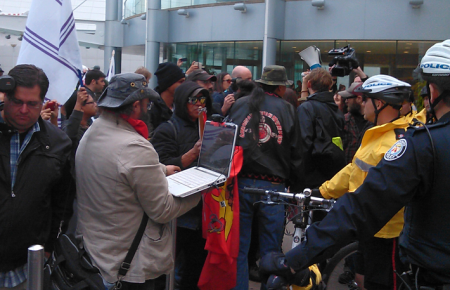 After a series of speeches the protestors proceeded towards the convention centre, where the hearings were taking place. Police blocked the protestors from entering the building but after a brief scuffle a handful of women were allowed to enter the hearings including Nina Wilson, one of the founders of Idle No More. The protests continued and eventually more protestors were allowed to enter the hearings. Several First Nations have opposed Enbridge's reversing the pipeline which runs through their territories. They have raised fears that the pipeline could be used carry diluted bitumen, which would increase the likely hood of an oil spill due to it's acidity and needing to be pumped at a higher pressure and temperature.